EXCLUSIVE Le Creuset’s cast-iron Dutch ovens are perfect for slow cooking, simmering soups and stews, and baking everything from side dishes to artisan bread. Tight-fitting lids seal in moisture, ensuring your slow-cooked dishes are steadily basted in their own juices for moist, delicious results. Available in a wide range of Le Creuset’s vibrant glazes, these ovens add a touch of classic French beauty to any kitchen or tabletop. Unmatched versatility, superior cooking performance and heirloom quality will keep you reaching for them for years to come. Love this Dutch Oven - I've used it several times now and I have been so impressed, I bought it's sibling - a 3.5 Qt. Braiser. This is the best low and slow cooker I have ever used, and the clean-up is easy. The only drawback is the weight. I have had Le creuset for years and recently purchased many pieces in “honey “. LOVE IT !! Convenient & efficient wedding gift giving experience. Purchased for a wedding gift on Sue La Table Wedding Registry, all went smoothly and gift was delivered ... only issue was unable to find gift card to send a note with the gift , but otherwise convenient. Love, love, love it! It goes from burner to oven and makes perfect dishes every time--even when the cook has limited talent! It's heavy but no more so than my other cast iron cookware. For a small to large family size I like it very much. Can cook two meals for two different days at one time. Tried it and it works for our family of four. One Pot meals and Soups I say give it a try. This is the perfect size for a family of 5, it's super easy to clean, heats up quickly, holds the heat, distributes it evenly, and it looks good, especially since I added the stainless knob on top. Love my Le Creuset 7 qt round I purchased from Sur La Table, so this one is purchased as a gift! We've been coveting it for years! I LOVE my Le Creuset pieces and am adding to my collection. The sea salt color looks gorgeous online and I hope it is as pretty in person. My wife absolutely loves Le Creuset products, and this is a gift for my daughter and son-in-law. We know they'll love it. This size is very useful for cooking! We have owned and extensively used ours for more than 30 years! Wanted to give one as a wedding present to a relative. Ive been wanting it. Good even heat for stews. Adding to my Le Creuset collection. My wife has always wanted a Le Creuset. Needed another size to help with my culinary cooking for my family and friends. We love trying out new dishes from all over the world. I have had Le Creuset Signature Round Dutch Oven 3.5qt for past 11 yrs but I burned it. So I decided to purchase another one with bigger size as I cook stew like foods all the time. Love to cook. And I'm worth it. Have the 7 1/2 quart Dutch oven and wanted a smaller size for smaller recipes. I chose it because my daughter has it and she is really happy with it! It's a gift for my daughter-in-law. 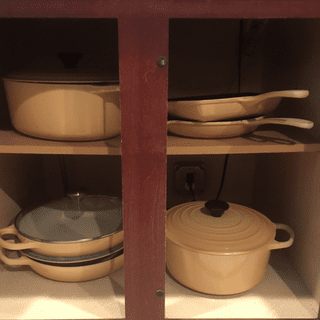 I have had mine for many years and am devoted to Le Creuset cookware. This dutch oven is my most used. Excellent cookwear that I have used for years. Getting Dutch Oven for daughter and her family because it is such a functional piece that I use almost every day. Perfect size for small families! I have three le creuset pieces and I love them This one is a gift for my daughter. Beautiful and useful dutch oven at a great price for the season. Le Creuset the elite of cast iron! What are the dimensions of the 4.5 quart round Dutch oven? Can you use this pot for everyday water boiling and pasta? BEST ANSWER: Yes you absolutely can! I find that with my cast iron it even boils faster because the cast iron retains the heat so well. Yes, it is great. I would not buy it online though. The item was in stock, paid for expedited shipping and took 10 days to leave their warehouse. Got no resolution from customer service. What is the lid number (22,24,26) for the 4.5 qt round dutch oven? BEST ANSWER: Mine came with the size (#24) lid and is fits neatly. Have excellent results when cooking with both pieces. I gave it as a gift, but I believe it is a 24. You can find the conversions online. Does this line of cookware have a flat bottom suitable for for a flat ceramic top electric stove? Is this the same as the signature collection? BEST ANSWER: Yes, it is. All Le Creuset cast iron pieces we carry are part of the updated Signature collection. thank you so much!! I was hoping so! Does the 20#% coupon apply? BEST ANSWER: That brand has chosen not to participate in our promotions.